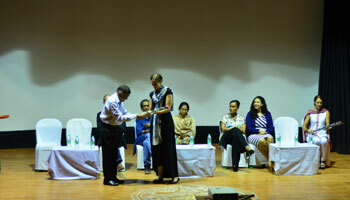 The first edition of the Sundance Film Forward in collaboration with Documentary Resource Initiative opened in Kolkata today. Sundance Film Forward is a touring program designed for 18 to 24 year olds, students and artists that offers film screenings and discussions to excite and cultivate new audiences for independent film. It uses the power of cinema to promote broader cultural understanding, inspire curiosity and enhance awareness of shared stories and values across generations, religions, ethnicities and borders. This edition brings two films to Kolkata: Difret,along with its Producer MehretMandefro and Little White Lie, with its Director Lacey Schwartz. These are two of the eight films that were selected and mentored through Sundance Institute’s annual program. The Director of the Film Forward Initiative, Ms. Meredith Lavitt and Bethany Clarke, Manager of the Film Forward Initiative also will accompany the SFF team. Little White Lie documents the personal story of director Lacey Schwartz as she confronts a family secret that ultimately leads her on a journey of re-discovery, grappling with her dual identity of being Black and Jewish. The power of tradition is challenged by modern law inDifret. The film tells the story of a 14-year old Ethiopian girl facing the death penalty after killing her would-be husband and a tenacious young lawyer brought to the small rural village to represent her. 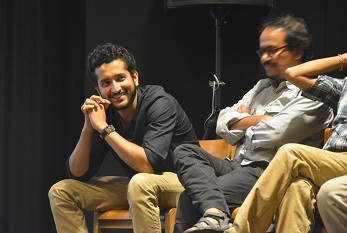 Discussion with producer MehretMandefro following the film. 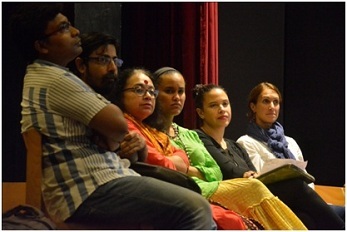 Little White Lie, directed by Lacey Schwartz, was screened at the Department of Mass Communication at St.Xavier’s College, Kolkata, and was attended by the students and the faculty. 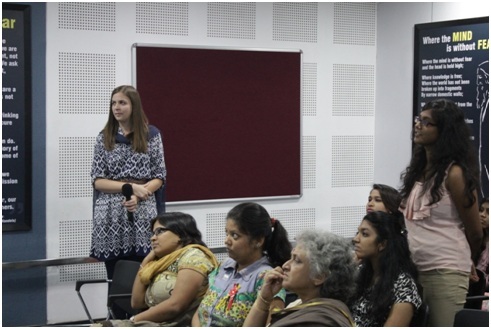 Following the screening, Ms. Meredith Lavitt, Director of the Film Forward Initiative of Sundance Institute introduced the program and briefed the students about the new genre of independent films that it supports, which has included many from India such as The Lunchbox and Amrita. 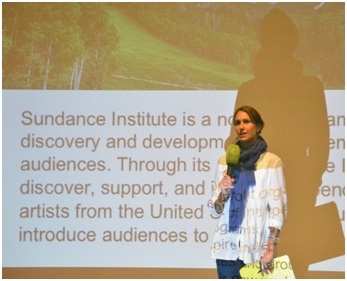 Sundance Institute Film Forward Initiative Director Ms. Meredith Lavitt introduces the program. Director Lacey Schwartz spoke about the film as the product of her quest for identity, which was a prolonged internal struggle after years of living in denial. 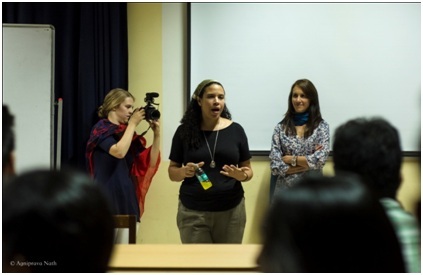 Responding to questions from students about the film making process, Lacey admits that having conversations on uncomfortable issues with her family, and that too being filmed, did come with its share of difficulties. 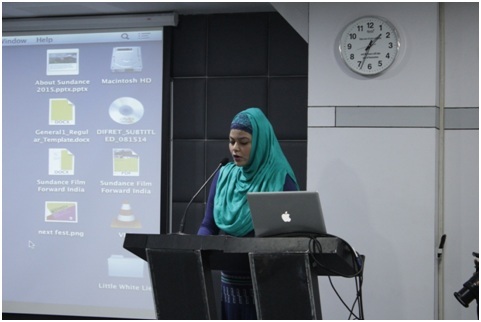 She also spoke about the relationship between the director and editor, which is a give and take- which on one hand should give power to the editor, while also providing sufficient direction to the editor in order to end up with the narrative that was envisaged. Director of Little White Lie, Lacey Schwartz talks about the film making process. 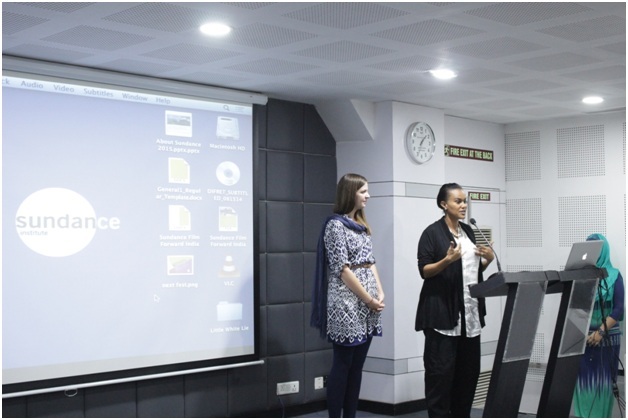 Difret, produced by MehretMandefro, was screened at iLead, Tangra, Kolkata, and was attended by the students and the faculty. Briefing about the program at iLEAD. 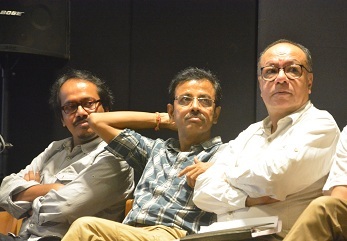 Satyajit Ray Film & Television Institute, Kolkata. The student audience also had questions about why each of them chose the narrative format they did- whether fiction or documentary. 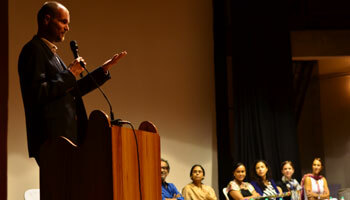 The engrossing master class was thrown open for Q/A . While the screening was in progress for a mostly student audience, Lacey Schwatz and Meredith Lavitt separately had a ‘meet the press’ session. 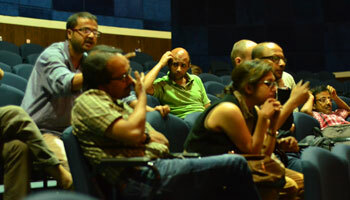 This was followed by a general Q&A session with the audience about Little White Lie. 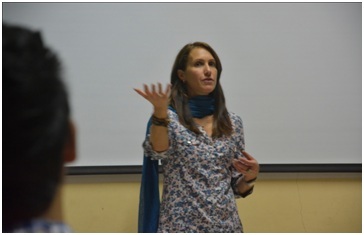 Ms. Meredith Lavitt spoke about the power of storytelling to bring audiences together. Following the screening, Ms. Lacey Schwartz responded to queries from the audience, particularly about making a personal film and getting the family to talk on camera, when they weren’t otherwise talking to each other in the first place. She also spoke about her decision not to turn it into a larger socio-political issue, and of rather keeping it at the level of a personal search for belonging and identity. 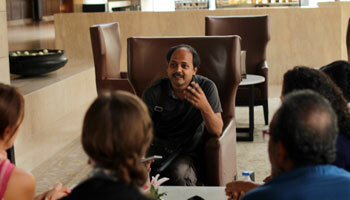 ShriNilotpalMajumdar, DRI, introduced the Sundance FF initiative as an effort to engage with young audiences around the world, and the filmmakers’ roundtable as means by which eminent local film makers could interact with the Sundance team and the Director/Producer of the films that are touring Kolkata. 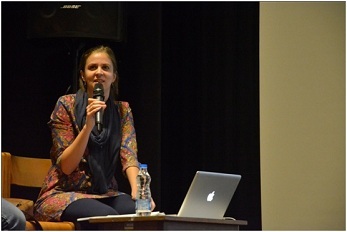 Ms. Meredith Lavitt, Director of the Sundance Film Forward initiative explained that the objective of this programme is to discuss the realities of creative producing, and to provide a support system for film makers that would make such creative endeavours sustainable. Its purpose is to keep aside local anguishes for a while and understand the international market and gain wisdom from it. Sundance Institute is interested in understanding local realities, while at the same time, is looking for new modes of working together. Meredith Lavitt then introduced Lacey Schwatz and MehretMandefro, adding that they had worked on each other’s films, which makes their combination unique. 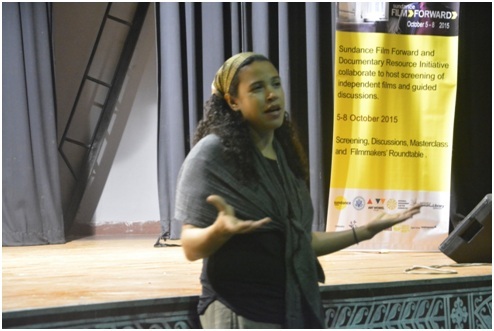 Meredith Lavitt, Director of the Sundance Film Forward, gives a background about the program. Bethany Clarke, Manager of the FF initiative explained the various kinds of support available under the Sundance program. 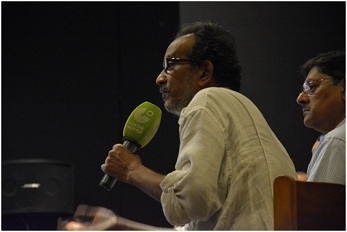 This was followed by an introduction of the participants at the filmmaker’s roundtable. 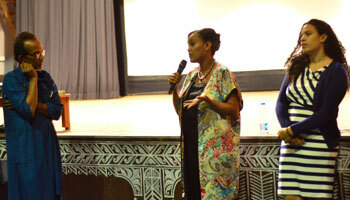 The Roundtable was followed by the screening of Difret.